So you’ve finally tried your hand at rock climbing and it turns out you love it! The physical challenge, the social aspects, the problem solving, the feeling of defying gravity – you’ve been hooked by it all. Are you wondering how to get from first-time gumby to proficient expert as quickly as possible? That’s where we come in with our very best rock climbing tips for beginners. 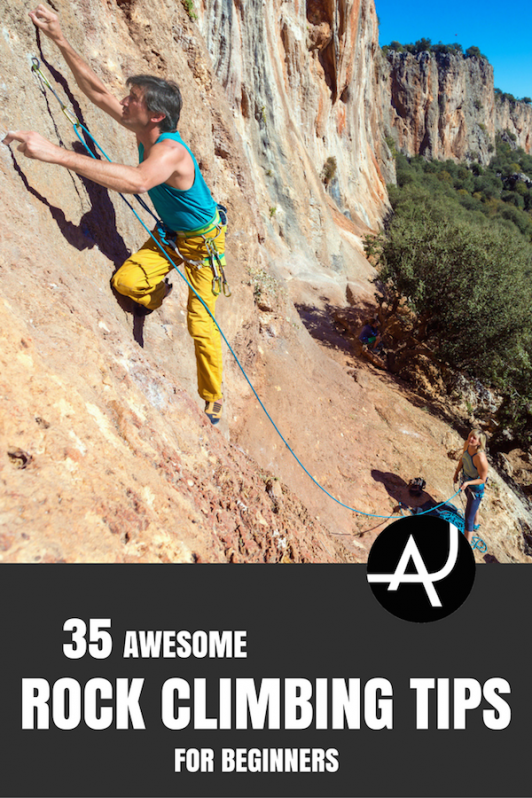 Here at The Adventure Junkies we understand firsthand the addiction to rock climbing. We also know that improving at the sport is a lifelong pursuit. 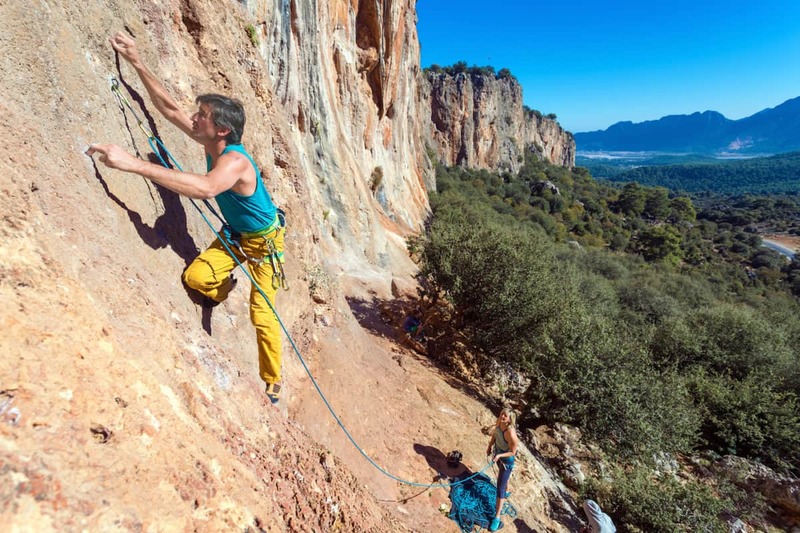 To help you with that mission, we’ve put together a list of tips to up your climbing game whether you’re brand new to the sport or have been at it for years. 1. CLIMB WHENEVER YOU CAN. 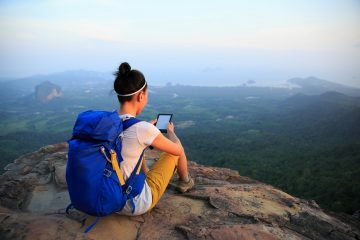 When you are starting out, there is no substitution for spending as much time as possible actually climbing. Climbing gyms are a great resource as they offer many routes spanning a wide range of difficulties and styles. Gyms are also a great place to pick up tips by observing others. 2. TAKE AN INTRO TO CLIMBING COURSE at your local climbing gym. Intro courses are especially vital if you will be doing any rope climbing. Instructors will teach you how to belay safely, how to tie a figure eight follow through knot and how to communicate effectively. 3. FIND A MENTOR in the community. With the rise in popularity of modern climbing gyms, rock climbing mentorship is becoming less common. If you can find a trusted expert in your community who is willing to mentor you, you can benefit immensely from his or her knowledge. 4. CONSIDER SETTING PERSONAL GOALS to help motivate you. These can be as simple as managing your fear of falling, learning a new technique, or pushing yourself into a new grade range. Ensure that your goals are SMART: Specific. Measurable. Attainable. Relevant. Timely. 5. START A CLIMBING JOURNAL to track your mental and physical progress. 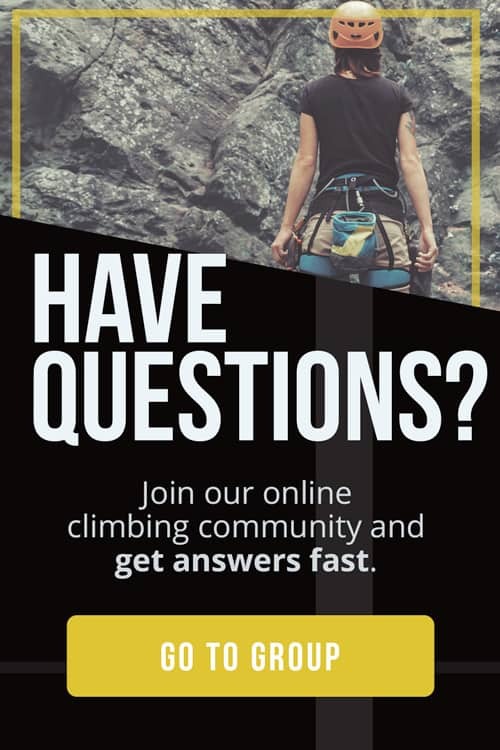 If you transition to climbing outdoors, consider joining an online track-your-climbing platform like 8a or Sendage. These sites are community spaces where people can share and view climbs they’ve completed and get psyched to try new things. 6. MAKE A LIST OF PLACES YOU WOULD LOVE TO CLIMB. Rock climbing trips can take you to some breathtaking corners of the world. A few Adventure Junkies suggestions include: Yosemite, California. Kalymnos, Greece. Rocklands, South Africa. Chiang Mai, Thailand. Blue Mountains, Australia. 7. CLIMBING IS MUCH MORE ABOUT TECHNIQUE THAN BRUTE STRENGTH. Any experienced climber will tell you that being a GOOD climber is key when you are just starting out. Learn good movement, careful footwork, balance, and body positioning before worrying about getting stronger. 8. LEARN HOW TO USE YOUR FEET EFFECTIVELY. 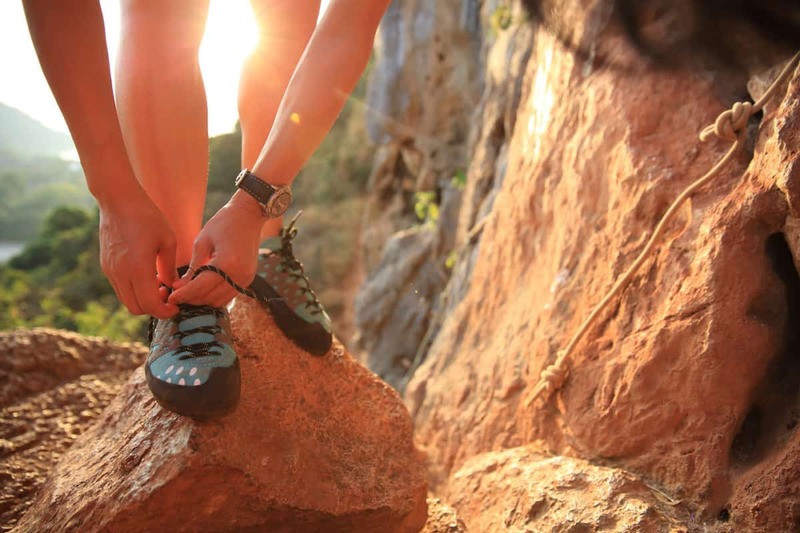 Careful, intentional foot placements can increase the control you have over your climbing. Great climbing begins with great footwork – watch any expert and you’ll find their foot placements are always silent and deliberate. A great way to practice is by adding footwork drills into your warm up. 9. TRY TO KEEP YOUR ARMS STRAIGHT and make use of your skeletal advantage. Holding yourself up with bent arms (a lock-off position) is extremely tiring and will build up the lactic acid in your forearms, pumping you out in no time. 10. KEEP YOUR CENTER OF GRAVITY (COG) LOW, CLOSE TO THE WALL, AND ABOVE YOUR BASE OF SUPPORT. This will help you to use the big muscles in your legs more, dissuading you from pulling in too much with your arms. It will also make it easier to maintain stable balance while resting and while moving. 11. LEARN THE DIFFERENCE BETWEEN STATIC AND DYNAMIC CLIMBING. Static climbing is slow and controlled and most moves are essentially reversible. Dynamic climbing utilizes power and momentum, and is useful when you need to move your COG over larger distances before resuming stable balance. Dynamic moves are usually irreversible. Both static and dynamic climbing are useful movement strategies. 12. GET YOUR MENTAL GAME DIALED IN. The mental aspects of rock climbing are arguably as important as the physical aspects. Learn to focus and concentrate, deal with fears, accept failure, handle your ego, engage in positive self-talk, and more. The Rock Warrior’s Way is a fantastic resource with tons of applicable exercises. 13. It’s crucial to WARM UP BEFORE CLIMBING to help prevent injury. Your warm-up should include three stages: 1) light cardio to raise your heart rate and get blood flowing, 2) dynamic stretching, and 3) sport-specific warm-up, such as 30 minutes of easy bouldering. 14. DO CRITICAL OPPOSITION EXERCISES to take care of your body’s balance and composition. Climbers do a lot of pulling and tend to have overdeveloped lats and shoulders. The climber’s hunch is a very common posture seen in those who are not maintaining balance in their upper body. Some basic opposition exercises include push-ups, dips and shoulder presses. If you are prone to elbow pain, wrist opposition exercises are a great idea too. 15. WORK ON STRENGTHENING YOUR CORE. A six-pack may look good, but is not especially useful for your climbing. Focus on your lower front and back core that will help you keep your feet on the wall in steep terrain, and the small muscles that help with body tension. 16. MUSCLES DEVELOP AND STRENGTHEN QUICKER THAN TENDONS DO. If you are discovering rock climbing as an adult, the tendons in your fingers are likely not very strong. Pace yourself on difficult problems and small crimp holds so as not to injure your fingers. Finger injuries are common in climbers and can set you back significantly. 17. ENGAGE YOUR SHOULDERS when you are climbing. By drawing your shoulders back and squeezing your scapula together, you force your shoulders into a healthy position for climbing and can reduce your chance of injury. Shoulder stability exercises are another great way to keep your shoulders functional and strong. 18. Split tips. Flappers. Cracked skin around your nails. Trad gobies. Whether you are climbing in the gym, jamming cracks, or bearing down on razor sharp edges outside, your hands will get trashed. 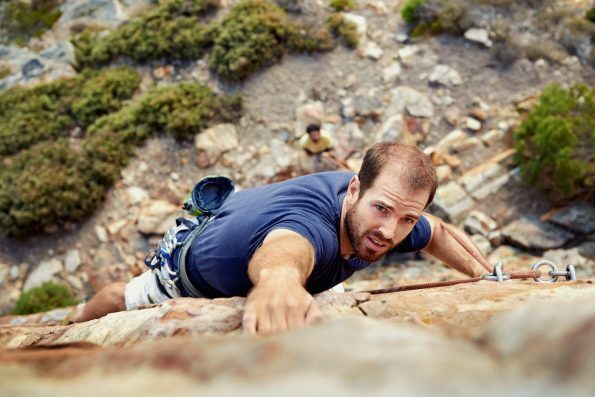 DON’T LET BAD SKIN BE YOUR LIMITING FACTOR and instead try one of the many climber hand balms on the market. They really do help, trust us. 19. USE MASSAGE TOOLS like a theracane or foam roller to work out knots and tight spots. You might have sore muscles you didn’t even know you had, and your shoulders, lats, and forearms will surely feel worked after a good session. If a massage therapist is out of your budget, do what you can to work the knots out yourself. 20. SIGN UP FOR A YOGA-FOR-CLIMBERS CLASS. If you can’t find a climbing specific yoga class in your area, any yoga will still be beneficial. You can also check out YouTube channels like Fightmaster Yoga and Climber Yoga. Yoga can increase your flexibility, core strength, and your mental focus, all things that can go a long way on the rock wall. 21. As soon as you are hooked by climbing, CONSIDER BUYING YOUR OWN SHOES AND CHALK. Climbing shoes are critical for learning how to use your feet while climbing. These are the only two items you actually NEED to go bouldering, and they will give you independence for any other kind of climbing you wish to try as well. 22. ASK AT YOUR LOCAL CLIMBING GYM ABOUT SHOE DEMO NIGHTS. Product representatives for climbing shoe brands like Evolv, Five Ten, La Sportiva, and Scarpa often offer shoe demos at climbing gyms. Demos are a great way to test out different models first hand before you buy. Keep an eye out for shoe demos at climbing festivals as well. 23. LEARN AS MUCH ABOUT GEAR AS YOU CAN. Companies release information about all their latest innovations each year, and are a great resource if you really want to geek out. We at The Adventure Junkies also give tips for buying essential new climbing gear, like beginner shoes, harnesses and ropes. 24. BUY SUBSCRIPTIONS TO CLIMBING MAGAZINES, or if you’re a traveling dirtbag, read climbing magazines for free in climber run coffee shops and gear stores. 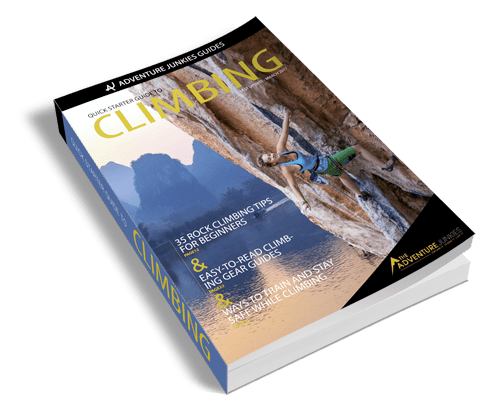 The big three in the USA are Climbing Magazine, Rock and Ice, and Alpinist, and the Canadian Gripped Magazine is also awesome. 25. FOLLOW CLIMBERS THAT GET YOU PSYCHED ON INSTAGRAM. 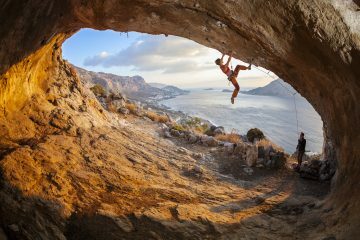 As the cliché goes, pictures are worth a thousand words, and there’s nothing like some sick climbing photos to get you inspired. The climbing community is very active on Instagram and overall super positive as well. 26. WATCH CLIMBING MOVIES. The Reel Rock film festival is a great place to start. Currently in their eleventh year, a new Reel Rock short film collection travels the world annually inspiring climbers and stoking the stoke. 27. LEARN YOUR CLIMBING JARGON. Ever walk into the climbing gym and feel like you’re listening to another language as climbers trade beta on their latest projects? Learn the terms and join the conversation. 28. If you have the unfortunate luck of sitting at a desk all day for work, TRY LISTENING TO CLIMBING PODCASTS. The pioneer rock climbing podcast is the Enormocast, and features candid face-to-face interviews and story-telling with climbers from around the world. Other great audio media includes Chalk Talk, TrainingBeta, and the Power Company Climbing podcast. 29. KNOW THE DIFFERENCE BETWEEN ONSIGHTING, FLASHING, AND REDPOINTING A ROUTE. Each of these terms refer to climbing a route clean (no falls, takes, or pulling on gear). Onsight a route means you’ve sent it first try with no previous information at all. Flashing means you’ve sent it first try but either previewed the route or received beta (information) about it. Repointing means you’ve sent the route after already trying at least once. 30. Many climbing gyms have adult teams, recreational teams, or women’s groups. Joining a team is a great way to MEET PEOPLE IN THE COMMUNITY and expand your skills on a regular basis. 31. ATTEND A LOCAL COMPETITION AS A COMPETITOR OR A SPECTATOR. Most competitions have a beginner or recreational division, and expose you to a ton of new problems with a bunch of really psyched people. Attending competitions as a spectator is also a great way to see some of the best climbers in the community give it their all. 32. If you are making progress with your technique but would like to excel even more, CONSIDER ADOPTING A BEGINNER TRAINING PLAN. Ask at your local gym to see if they offer training programs, or check out Training Beta for a ton of great online resources and plans. 33. 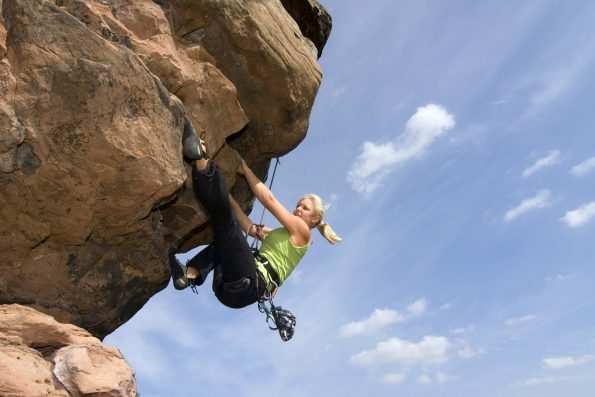 Moving from indoor to outdoor climbing can be overwhelming and dangerous. Unless you have a super awesome and reliable mentor with a lot of experience, WE RECOMMEND HIRING A GUIDE FOR YOUR INITIAL TRANSITION TO REAL ROCK. Professional rock guides in the USA are certified by the American Mountain Guide Association (AMGA). 34. Climbers pride themselves in the respect they show for their crags. 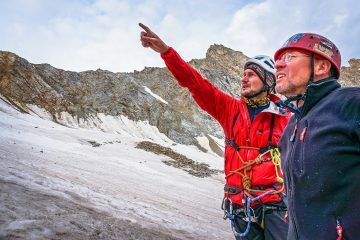 LEARN ABOUT THE CODE OF ETHICS THAT CLIMBERS ADHERE TO WHEN CLIMBING OUTDOORS. A few principles include leave no trace, wait your turn before climbing, don’t play loud music or be obnoxious, help with trail maintenance, brush your tick marks, avoid spraying beta, and respect route or area closures. 35. ATTEND CLIMBING FESTIVALS to immerse yourself in all aspects of climbing culture. At festivals you often have a chance to participate in crag clean-ups, attend sweet climbing workshops, listen to slideshows, meet climbing gear vendors, get free stuff, and make awesome connections. A few great festivals to get you started are the Red Rock Rendezvous, the Smith Rock Spring Thing, the Lander International Climbing Festival, the Red River Gorge Rocktoberfest, and the Women’s Climbing Festival in Bishop.